Amaru is a young girl who came from a village in the Land of Fire. When she was an infant, the Reibi was sealed into her to feed off the negative emotions of her surrounding villagers. Because of this, she became alone and shunned from social interaction with the people of her her village all her life. Later, she fell sick and was rescued by a kind doctor named Shinnō, who Amaru grew to idolize. After which, Amaru insisted for Shinnō to make her his student, to which he agreed. Naruto Shippūden 2: BondsAfter the infamous Sky Ninja decimated Konohagakure, Amaru arrived to aid in healing people alongside her sensei Shinnō. She quickly made it clear how much she admired her teacher. After helping with the injured, she and Shinnō were escorted back to their village by Naruto, Sakura, and Hinata. Upon arriving at the village, they discovered that it too was destroyed by the Sky Ninja. Horrified by the sight, Amaru accidentally triggered a trap that would have killed her had Shinnō not saved her at the cost of his own life. 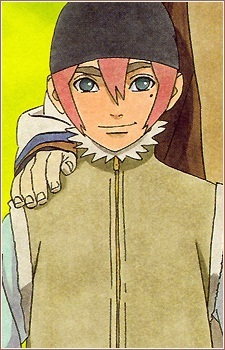 Wanting to make her sensei proud, Amaru joined Naruto in rescuing the villagers, which lead them to an old ruins that turned out to be the Sky Ninja&#039;s headquarters and mother ship. To Amaru&#039;s delight, she discovered that Shinnō was still alive. But her joy quickly turned to horror as Shinnō revealed that he was working with the Sky Ninja and that the kind man he appeared to be was a lie. He also revealed to have been the one who implanted the Reibi in her, so as to gather massive amounts of dark chakra. Falling into despair, she was given new hope from Naruto who convinced her that while Shinnō himself may have not believed in what he taught her, there is truth to valuing life. Amaru then went off to find and rescue the villagers that were locked up. When the mother ship began crashing from the sky, Naruto forced her to join the villagers in a smaller ship, but she chose to jump after Naruto to be there for him for a change. They fell from the sky and they were saved by Jiraiya summoning Gamabunta to cushion their fall.